Label: Columbia, Syco, Sony Music Entertainment. 'Heavenly Christmas' is American singer Jackie Evancho's first full-length Christmas album, and her fourth album overall. It was released when she was eleven years old. This album contains ten tracks and was produced by Rob Mounsey, with arrangements by Mounsey and Ryan Shore for Sony Music Entertainmen. The album was released on November 1, 2011, exclusively at Walmart and Walmart.com in the US., and at other U.S. sellers on October 16, 2012.Jackie Evancho is accompanied by the Orchestra of St. Luke's and the New York Chorus of St. Cecilia, conducted by Rob Mounsey. The album climbed to No. 11 on the Billboard 200 chart and peaked at No. 1 on Billboard's Classical Albums chart, No. 3 on the Holiday Albums chart and No. 9 on the Canadian Albums chart. As of January 2012, over 300,000 copies of Heavenly Christmas had been sold in the U.S. Idolator.com readers chose Evancho's 'Believe' as their "Favorite Christmas Song" for 2011. 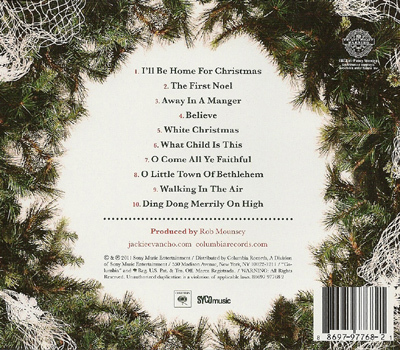 'Heavenly Chrtistmas' was the year's number one best-selling debut albums with sales of over 1 million copies and Jackie recived a platinum plate. Jackie Evancho released music videos of three songs from the album, I'll be home for christmas, The first noel and Believe.